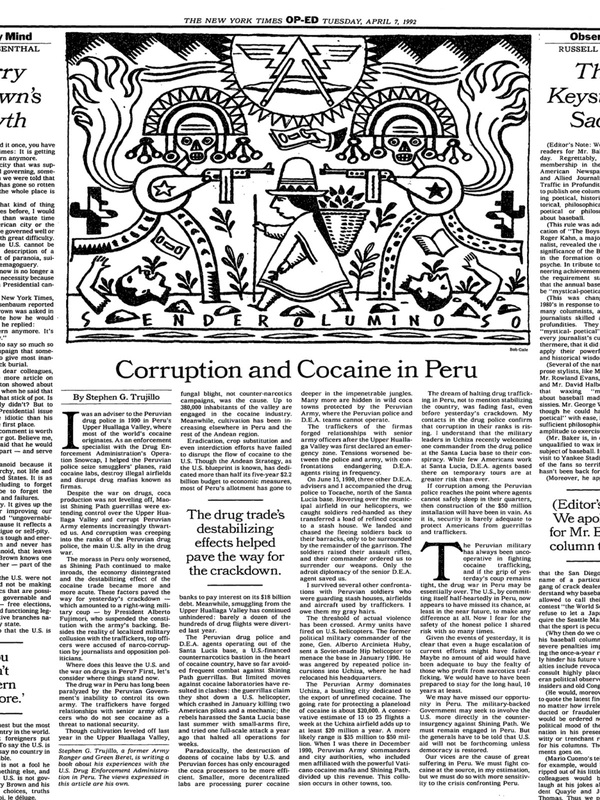 A friend found this copy of my first article published in The New York Times, April 7, 1992. 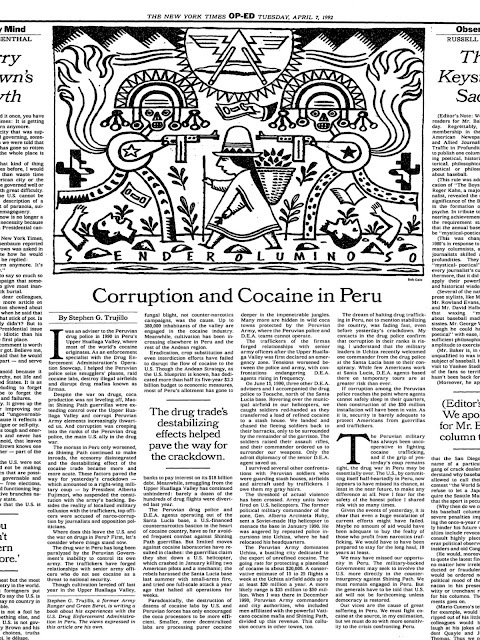 I published a follow-on piece the next day, "Peru's Maoist Drug Dealers." I posted both articles on Academia.edu, and I will republish them in coming books. So if you are curious, just search under my name on Academia.edu and you shall find them. These two articles are teasers, if you will, of the sort of content that will be featured in my fourth book, projected for publication in 2018, In the Valley of the Shadows: A Place of Smoke and Rivers Like Mirrors. That was the book that I was writing in 1991, and I adapted these articles with an NYT editor for publication on the OP-ED page. We were going back and forth in an interminable process, when President Albert Fujimori perpetrated what history remembers as the autogolpe, and we went to press the very next day. I actually went up to New York on that day, my good friend Herb Bryant helped me, and I met with an agent who got me a meeting at Crown. The publisher there wanted me to write a book like Marcinko's Red Cell, and I had to tell him that that was not what I was about, at all. It has been a long, lonely road writing in obscurity since this early and isolated success in 1992, but I do not regret it. My first book, Idioms of Dreams: A Tale of the Grenada Raiders, is in the hands of an über-agent in Los Angeles, and I pray that he decides to represent the manuscript. I think that it would make a great screenplay, and that is not just greed talking. The Grenada memoir, which has been complete for some months now, has been reviewed on a secret Facebook page by all the Rangers named within it. They responded by sending me a deluge of further materials, which made yet another book an inevitability. That book is now titled Tales of the Rangers: The Oral Histories of the Early Modern 2d Ranger Battalion. It is now up to 777 pages, I am not kidding, and it consists principally of the stories told by Rangers to other Rangers around fires deep in the South Rainier rainforest. Much of it was written by those Rangers who lived those stories, and there are some doozies in it. Idioms of Dreams, in fact, was pulled from the first chapters of In the Valley of the Shadows, it was the first chapters of the larger masterwork, and then it just kept getting bigger and better. So I had to yank it out and publish it on its own. Then the bridge chapters that connected the Grenada tales to the Peru stories got too big, and I had to pull them out of Idioms of Dreams, and they now comprise my second book, Seeking the Rosetta Stone of Memories. Seeking the Rosetta Stone of Memories is mostly complete, as far as the narrative is concerned. I have some work to do sourcing old documents and photos to illustrate it, and I will get to that as soon as I get Idioms of Dreams into print. I apologize that this process is taking so long, I am very much a cherry where the publishing world is concerned, and I have to place myself in the hands of smarter people than me. Many of you know that I am now in Orlando, getting treatment at the VAMC here. I am in good hands, but they are very slow. So I wrote a letter to President Trump. It went out in Saturday's mail, so we shall have to give it a couple of weeks and hope that it does not get lost in the deluge of mail that the leader of the free world assuredly receives. If it somehow makes its way from the White House mailroom to his desk, I am confident that things can happen at a faster pace. I asked him to delegate my case to one of the young killer interns that he has working for him, I need someone to wave a magic wand for me here in Orlando and to crush some heads. I am surrounded by bureaucrats, administrators, who are trying very hard to handle an overwhelming crush of veterans seeking treatment. They seem to think that I need to have a heart attack before I see a cardiologist. I beg to differ. I would like to see a cardiologist before I have a heart attack, I have already had several false alarms, "unstable angina," my cardiologist in Bangkok called it, so we shall see what happens. It is sad being in Orlando, though I am staying with very, very good friends. I miss my wife and my silly cat in Bangkok, and after 13 years residing there, Bangkok is very much my home now. Anyway, the MSS of Idioms of Dreams is complete. Fingers crossed.